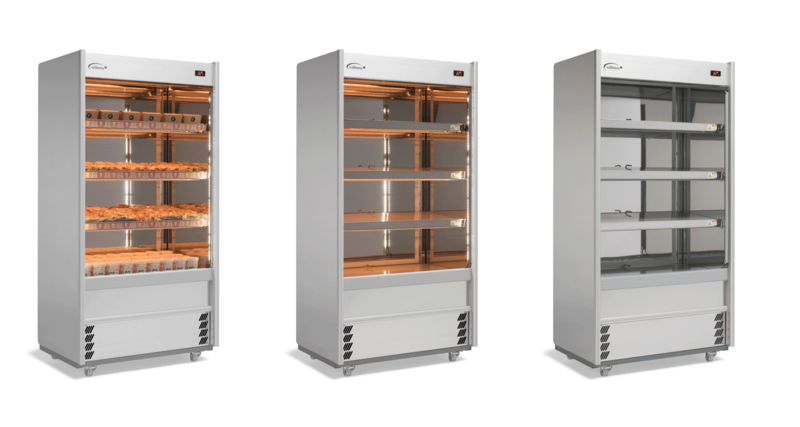 The perfect way to display hot food, the attractive Scarlet Multideck will generate grab & go sales while keeping accurate, safe temperature control. Ideal for all sorts of pre-cooked hot foods, from pasties to soup. Williams already offers a market-leading range of chilled grab & go merchandisers, in a comprehensive choice of sizes. The new Scarlet Multideck is our first heated model and will be shown to the market for the first time at The Professional Kitchen Show. Incorporating the great features that have made Williams merchandisers some of the most popular in the industry, the Scarlet also has the same sleek style as its refrigerated counterparts. The most important criteria for every grab & go unit is food safety. The Scarlet delivers consistent, reliable and safe heat via infra-red quartz halogen lamps. The heat is instant and uniform – so you know that your food is not only safe, but also kept in prime condition at just the right temperature. The Scarlet will maintain the ideal holding temperature of 65°C – 70°C for pre-cooked hot foods such as pies, sausage rolls, pasties and soups,. Food is displayed on the three tilted shelves and the interior base – each of which has its own, individually controlled temperature setting, which can be set to match the requirements of different food types. Like all Williams Multidecks, the Scarlet is designed to deliver an attractive display that will help maximise your grab & go merchandising sales. The bright interior has polished foodsafe stainless steel shelves and full length LED lighting. The optional panoramic glass ends offer increased visibility, so that customers can see the display from more angles. Designed to fit a wide range of customer requirements, the Scarlet has a slimline depth of just 635mm and comes in a choice of three widths: 710, 960 and 1250mm. All model are 1855mm high. It is available in a wide choice of colours and finishes, to match just about any décor and add that touch of style to the unit. The Scarlet is also designed to be easy to live with. Practical features range from the double wheel castors, for easy positioning, to the optional rear doors, which give staff access for restocking. Meanwhile its low operating noise level of 35dB is perfect for browsing customers!